One of the favorite feel-good policies of “gun control” advocates is the implementation of “gun ‘buybacks'”. Ignoring, for a moment, the glaring grammatical and logical problem in a government “buying back” something it never owned to begin with, there is another fly in the ointment: “buybacks” simply do not work. The police know they do not work, even anti-rights organizations know they do not work, but countless municipalities continue to flush money down the drain buying, and sadly destroying, junk guns and pieces of history. That last bit is the real source of frustration. How many families inherited their grandfather’s bring-back GI 1911, did not want to have anything to do with it, and turned it over to the police for a $100 gift card? (For reference, good-condition World War 2 1911s can sell for over $2000.) We know of at least one legitimate Sturmgewehr 44 that was saved from becoming an iron brick by way of a police officer who knew what he was looking at, but how many similar, irreplaceable pieces of history have been destroyed out of ignorance and a misguided need to “do something”? For example, I have a somewhat unique and definitely interesting firearm whose very metal tells a story all its own, but if it had been owned by a different series of people it may very well have been destroyed for no better reason than, “I don’t want it.” Thankfully, I did want it, and the rest, as they say, is history. These days, saying the word “Webley” in a gunny geek crowd is a good way of determining if the folks you are speaking to are younger than me, my age, or older, but the honest truth is pretty much everyone who watches movies and likes firearms knows the name and the somewhat peculiar top-break reloading action. Well, here is a further glimpse into history. “Webley” is actually short for “The Webley and Scott Revolver and Arms Company Ltd of Birmingham”, a once-Great British firearm manufacturing company founded in 1897 out of the combination of P. Webley & Son and W & C Scott and Sons (the former dating back to at least 1834) and closing in 2005. The name was eventually purchased by an airgun company in 2008 and the doors were re-opened, but the production of all Webley-branded products – which is now limited to airguns and shotguns – appears to have been moved to Turkey. Unfortunately, an insolvency meeting was held in 2011 and liquidators were appointed to wind up the affairs of the company; Webley’s eventual, repeated demise and sell-out can arguably be traced to once-Great Britain’s draconian firearm laws. However, in their time, Webley & Scott produced some amazing firearms, not the least of which are the Mars Automatic Pistol (a handgun that is still considered “ridiculously overpowered” even to this day) and the Webley-Fosbery Automatic Revolver (yes, you read that right). The handgun that put the company on the map of every movie-watcher and part-time gun aficionado; however, was known as nothing more than the Webley Revolver, or the Webley Self-Extracting Revolver if you want to get verbose. We Americans typically know them as the Mark series, spanning from I to VI; in reality, the revolvers were not given that designation until 08 November 1887, when the British Army formally adopted the .455 Webley revolvers as the, “Pistol, Webley, Mk I”. The Mark II was adopted 21 May 1895, the Mark III on 5 October 1897, the Mark IV on 21 July 1899, the Mark V on 9 December 1913, and the final variant, the Mark VI, on 24 May 1915. All of the Marks had distinct and quantifiable improvements on their previous brethren (for example, increasing the cylinder diameter to use higher-pressure powder), and all but the Mark III found their way into extensive British service, starting with the Second Boer War in 1899 and running all the way through the Malayan Emergency ending in 1960 and beyond. To begin with, the Mark series were chambered in .455 Webley; however, by the end of World War I, the British decided that particular caliber was maybe a bit of a handful for their soldiers, so they started looking for alternatives. To put things in perspective, the hottest .455 Webley loading of the time was a 224 grain bullet going 700 feet/second at the muzzle, generating around 250 foot-pounds of energy. In comparison, that is about what you can expect out of a modern warmish (but not +P) .38 Special round. Apparently limp wrists were mandatory accessories for British officers (which, given the way they trained with these, seems kind of funny). Upon hearing of the War Office’s desires, Webley teamed up with Kynoch Ltd (who apparently make much more interesting ammunition these days) in order to develop a stronger load for their old Mark III designs, which were chambered for a .38 caliber bullet. The end result was a 200-grain bullet sitting on top of enough powder to push it 630 feet per second at the muzzle, generating about 180 foot-pounds of energy. In other words, they re-invented the .38 Smith and Wesson cartridge created decades before, and developed a .38-caliber equivalent to a .22LR round. But it worked. 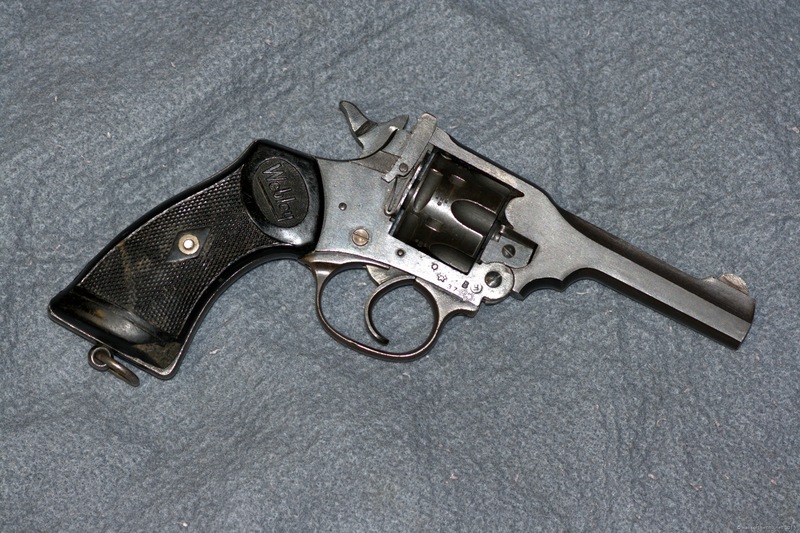 In fact, it worked well enough that the British government thanked Webley very much for their efforts, then figuratively walked across the street to Enfield and asked them to make this revolver, with enough changes for it to be an “original” design, of course. Webley was a bit put off by this, and tried suing to little success. 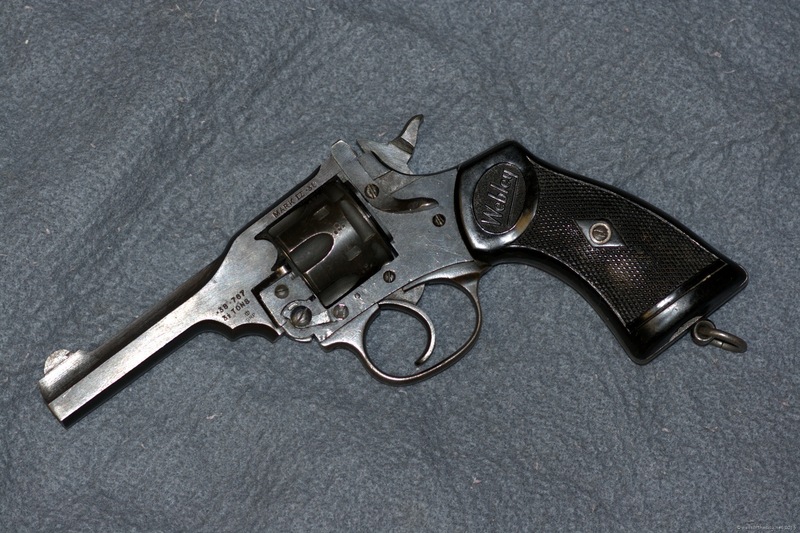 However, as was probably predictable given their history, Enfield were not able to keep up with the production demands of a nation gearing up for another war, so Webley was contracted to make their updated revolvers, annoyingly called the Mark IV. 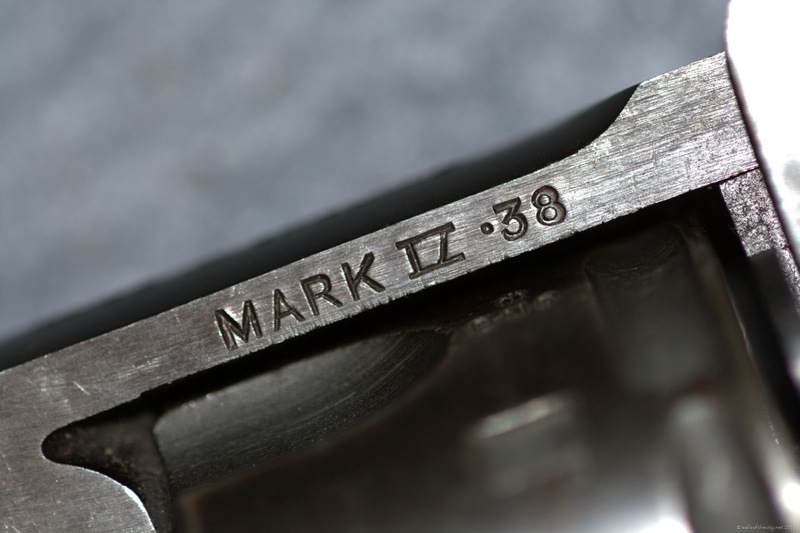 The .38/200 Mark IV has almost nothing in common with the .455 Webley Mark IV aside from their names, so the latter is generally called the “Boer War Model”. Why the former could not have been the Mark VII, I do not know. But all of this history and backstory brings us to the revolver in the photographs. Given that I am of the Indiana Jones / Torchwood generation, and have a particular fondness for break-action revolvers, I knew it had to have a good home, and the firearm only got more interesting when I started taking it apart. 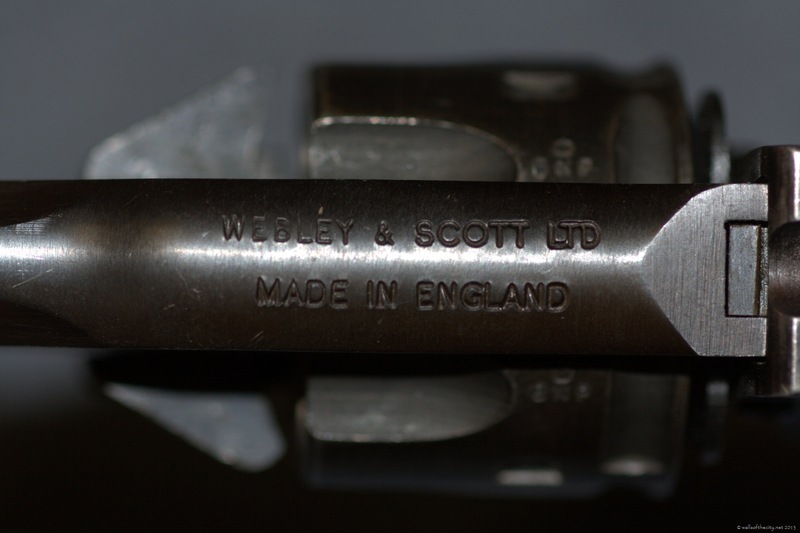 First, it is a Webley Mark IV; it says so on the frame (well, kind of, the striking was not perfect). 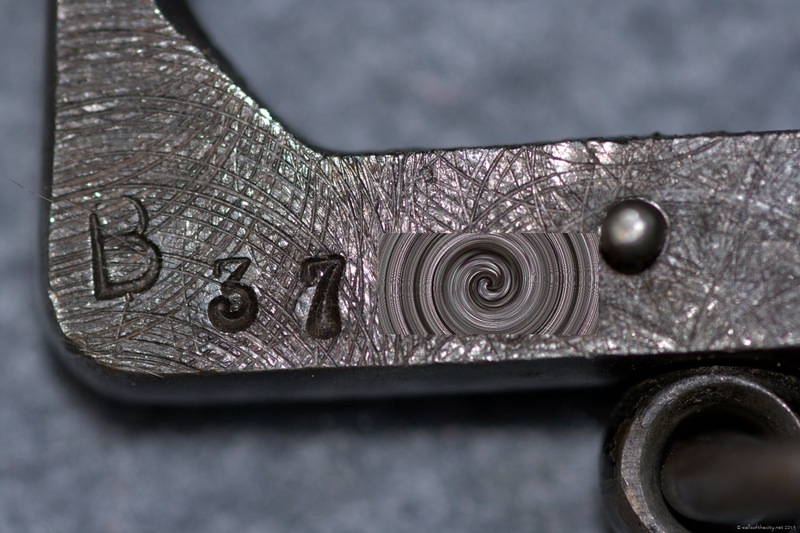 Second, I know it is chambered for .38 – 767; it also says that on the frame. “But wait! They are supposed to be chambered for .38/200, right?” Right – the case for those cartridges is 0.767 inches long. Third, to follow the theme, it also informs me that it was proofed to 3.5 tons per square inch, or 7000 psi. By way of comparison, the SAAMI cartridge pressure standard for 9mm is 35,000 psi, and .22LR is 24,000. “Anemic” would be a wholly generous way of describing the .38/200 / .38 S&W (at least those rounds loaded for Webleys; I understand Smith and Wesson revolvers can take a bit more pressure), since proof pressures are meant to be above standard operating pressures. 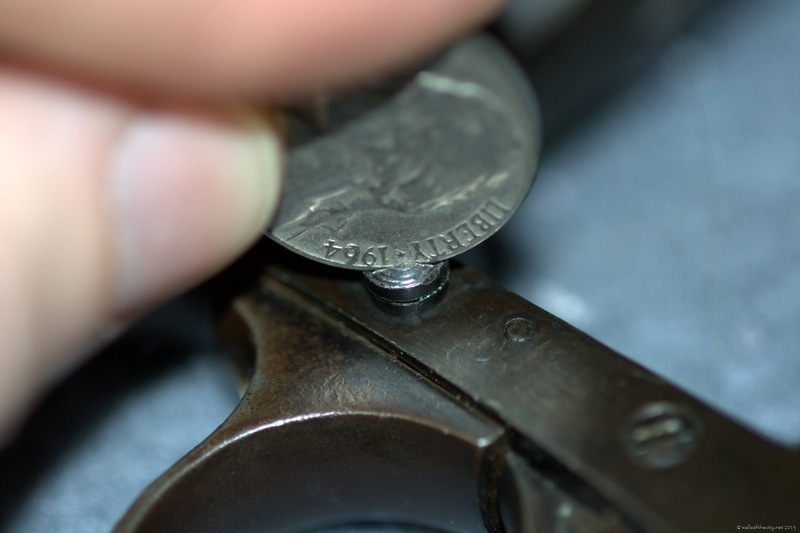 Fourth, this firearm really can be stripped almost all the way to bare metal using nothing more than a flathead screwdriver and an American nickel, and the latter is optional (but boy does it fit the cam lever lock screw well). A pin, not a screw, is used to hold the bolt / cylinder catch in place, though, so I did not bother removing it, but I found this gentleman’s directions more than helpful. Fifth, this particular Webley was fabricated in 1964, or, at least, its frame was. 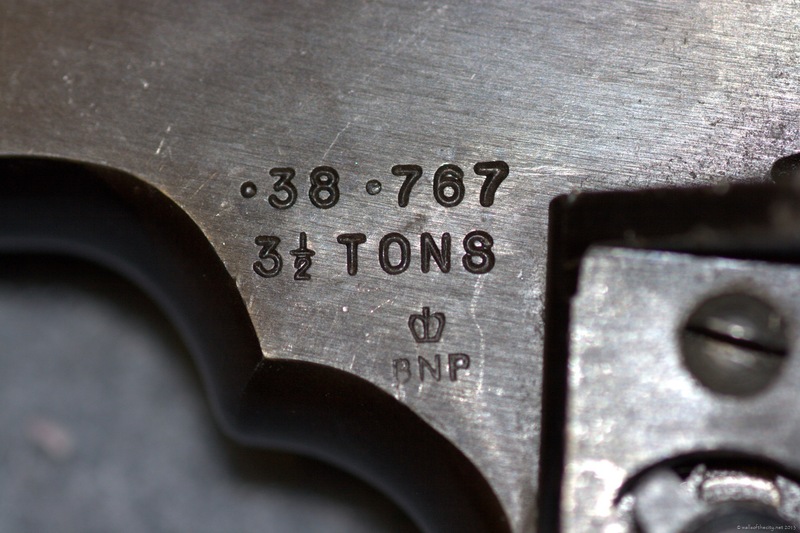 To begin with, the serial number on the side of the frame – 37### – has that “B” stamped directly above it. It turns out that “B” is not just a proof mark, but is instead part of the serial number itself, as better shown by the serial number hiding beneath the grip panels; this gentleman’s documentation indicates that number was struck somewhere between 1964 and 1968. But that does not narrow it down to exactly 1964, does it? Nope. But this proof mark does. What you see there is a pair of crossed halberds, with what could be a “P” in the left quadrant, a “B” in the right, and a “5” in the bottom. 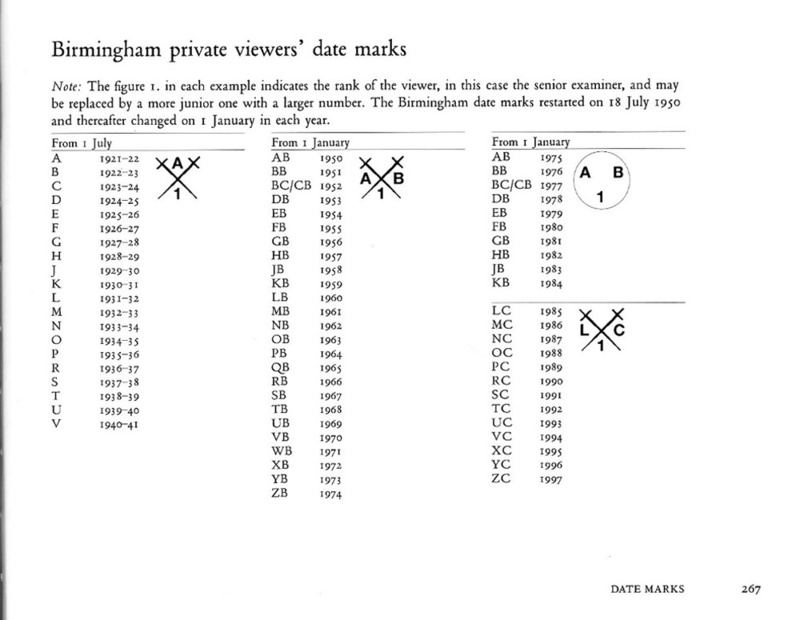 According to this image, the Birmingham Gun Barrel Proof House reviewers used that stamping pattern between 1950 and 1974, with “PB” indicating 1964, and the “5” being the inspector’s number. 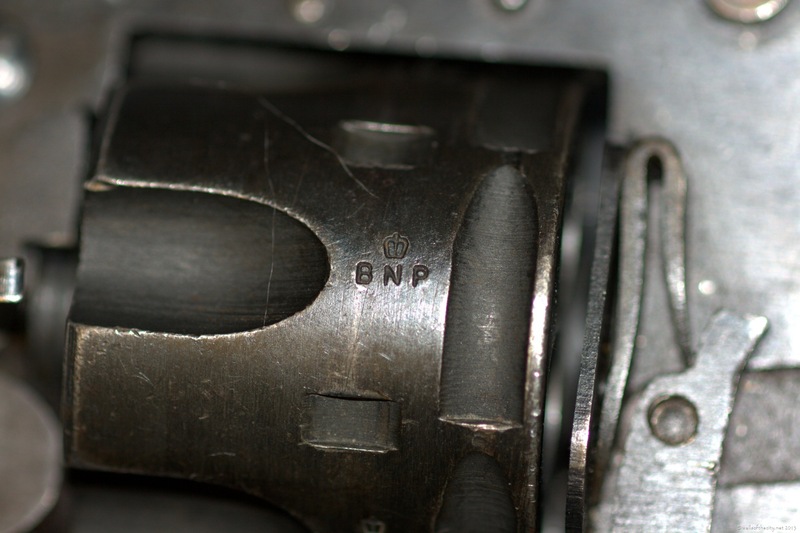 And while the date is pretty much set with those two stamps, a third stamp – the “BNP” with a crown over it, which stands for “British Nitro Proof” – was struck on the cylinder, frame, and barrel assemblies, and according to this handy-dandy listing of proof marks, that particular stamp was only used after 1954. While the frame was made in 1964, the cylinder is harder; its serial number is “B 49 # ##”, which puts its production date between 1968 and 1970. Sixth, mine is thankfully not mutilated with a pointless cross-bar safety, but it was fitted with a drop safety, the external indication of which is the extra, protruding screw on the right side of the frame above the trigger. 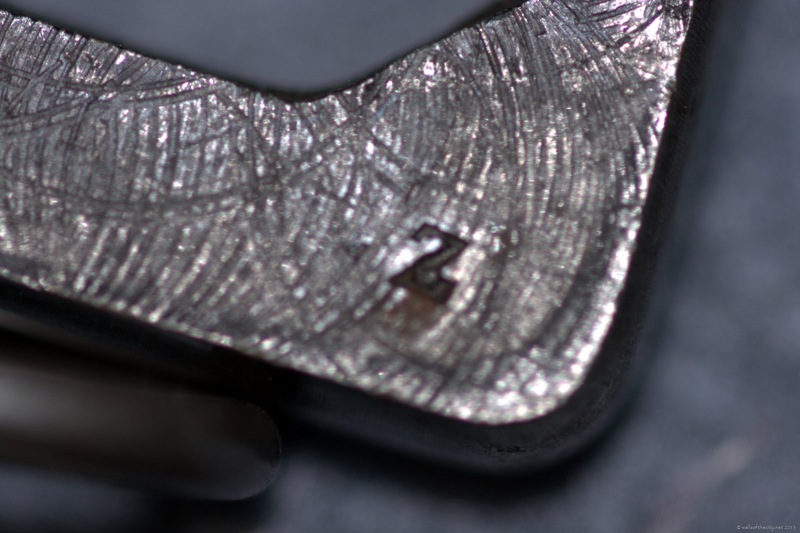 This screw operates as a hinge point for an internal linkage that connects the trigger to a little steel bar that goes up a machined groove to (kind of) block the hammer unless the trigger is actually pulled. 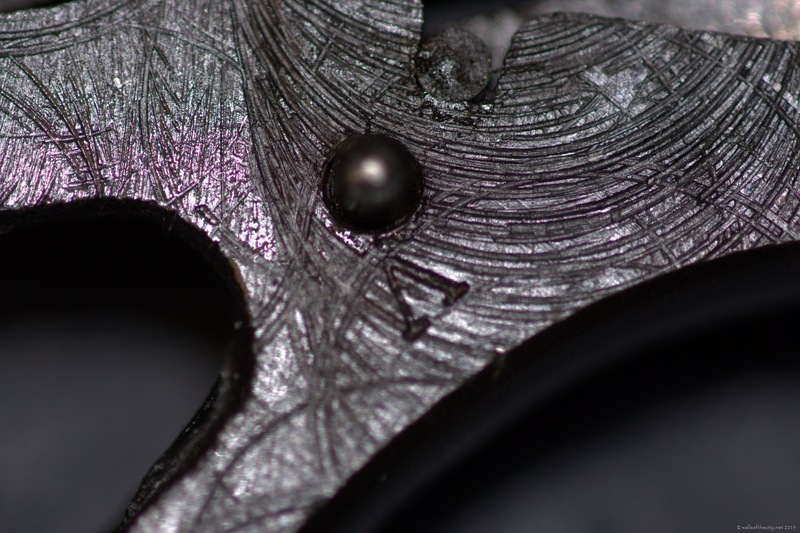 From experimentation, though, the springiness of the steel leaves something to be desired in regards to its efficacy. 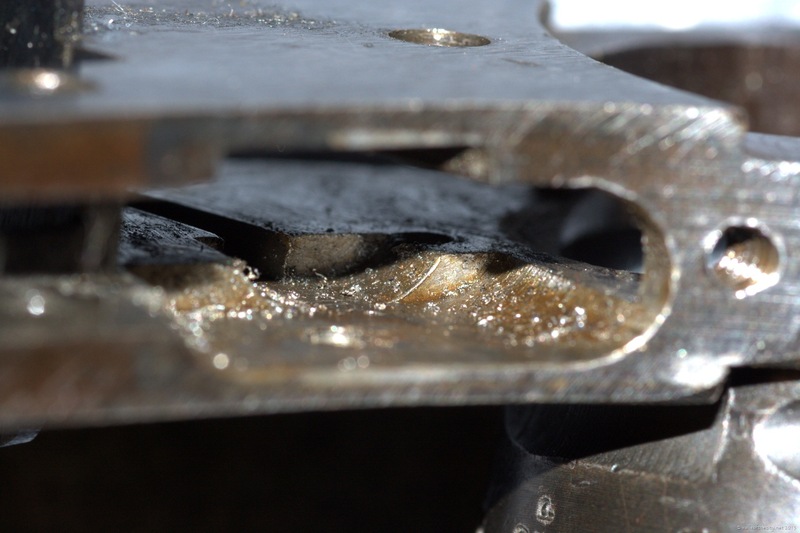 Seventh, whoever fitted it with that safety did not even so much as blow out the frame after it had been installed. There were still metal shavings all over the place. And now we get interesting. To the left of the serial number you see a Star of David with what appears to be a bracket laid down on its side inside it. To the right, there is a circle with a “y” with a really long tail underneath it. It turns out that is not a bracket, nor is that a “y”. The former is a “nun”, and the latter is a “tsadi”, and as you probably have guessed by now, the two being stamped on the receiver indicate this was sold to Israel at some point, probably back when the country was still new and was desperate for any and all firearms they could get their hands on. The tsadi would seem to indicate Israeli Defense Force usage, given that it is the first letter of “Tzahal”, which is the Israeli name for the IDF. But the line between IDF and “police” was somewhat… vague back then. In all likelihood, it was carried around by civilian or military police, and then somehow found its way back here without importation marks (I hypothesize that “in someone’s luggage” is a wholly acceptable explanation up until a few decades ago). 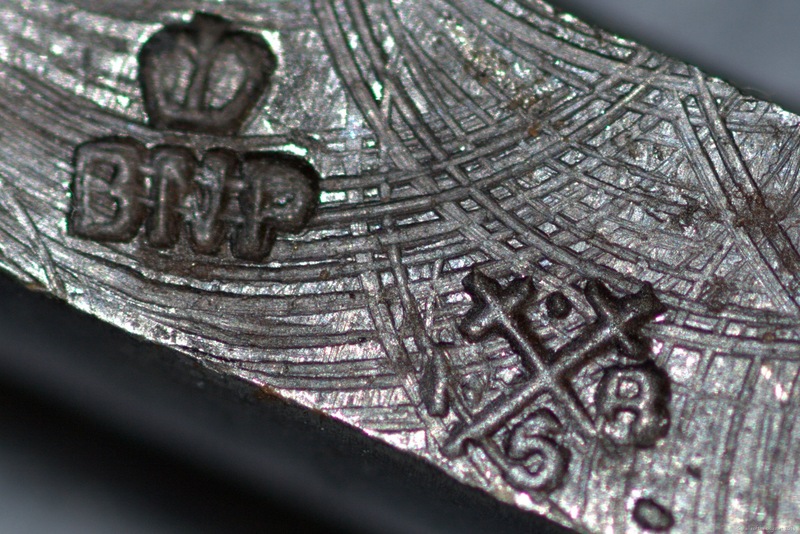 The only two stamps I have not been able to sort out are on the pistol grip underneath the grip panels – a “Z” and a “V”, without any crowns, halberds, or any other decoration. If it were really an N (but it is definitively not), it might possibly indicate use by the Royal Navy, and if the V had a crown with it, it would indicate it was “Viewed” (i.e. accepted as usable), but that does not appear to be the case. Yeesh. Do you think our kids will have as much fun taking apart our guns and trying to figure out what we were scribbling on them? In other news, someone needs to take the Brits’ stamps away from them; it is almost like they were trying to create a Victorian style of hieroglyphics. This is analogous to grinding Native American arrow heads to dust, or melting down Viking swords simply because they are scary. Or, more recently, burning books or destroying cultural heritage simply because you do not like it. Firearms are not for everyone. That is not only fine, that is great; the world would be a boring place indeed if we all had the same hobbies. But please, if you do not want it, take it to a firearm store and sell it to them – whatever price they give you will certainly be better than the chump-change gift card the police department is handing out. I promise you that no matter what the firearm, there is someone out there who will put it to a lawful, peaceful purpose, even if that purpose is only “taking up space in my safe”, as my Webley has been doing. Speaking of gun destruction and turn ins, it would be interesting to compare this gun to the one carried in WWI by C.S. Lewis and turned into a British museum by his family when handguns were banned in the UK. 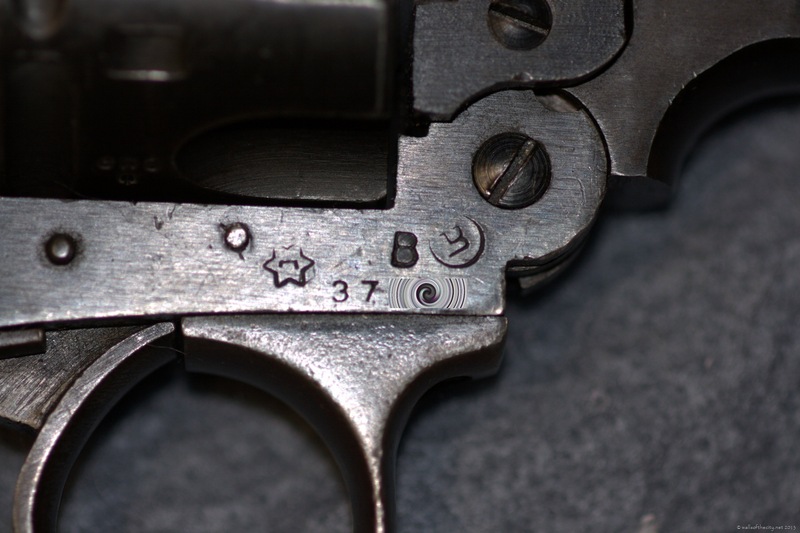 However, this is where things get weird – the only .38 caliber Webley was the second Mark IV, like mine above, and it wasn’t even designed until 1932, ruling it out of possible World War One use. As such, it wouldn’t surprise me if Lewis carried a first-generation Mark IV – a revolver designed in 1899 and using a .455 caliber round with cordite propellants, rather than the nitro-cellulose used by the Mark V and later. Next Next post: is “gun control” a “health issue”?